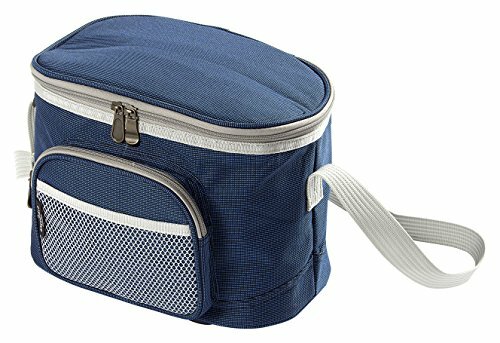 This 8 Litre cool bag has been designed to accommodate a combination of food and drink and is ideal as a large lunch bag or picnic accessory. Thick thermal walls create a fully insulated bag so that food and drink can be kept cool or warm for 5-7 hours using patented technology. Cooling time can be increased if ice packs are used in conjunction with the bag. On the front of the bag, there is a zipped pocket and a mesh pocket, both of which are great for holding small items such as keys or a mobile phone. Easy to carry webbing adjustable shoulder strap feels comfortable and sturdy. The midnight blue colour is paired with contrasting grey for a stylish finish. If you have any questions about this product by Greenfield Collection, contact us by completing and submitting the form below. If you are looking for a specif part number, please include it with your message.